ATOM WORD TUTOR consists of three versatile programs designed to aid the development of language abilities in children of primary school age. Each program is supplied with a sample database that provides the material for a full set of exercises, and the supervisor can enter further teaching material and build up libraries of databases on cassette. A simple, clear cursor method allows the pupil to answer the problems without typing. The names and scores of up to 16 pupils are recorded and can be viewed by the supervisor. Programs 5K, graphics 6K. Words are presented with pairs of letters replaced by blanks. The pupil can choose from up to four possible pairs, only one of which completes each word. One of each pair of related words is displayed along with a linking phrase. The phrase is completed by adding the second word of the pair, selected from the list on the screen. 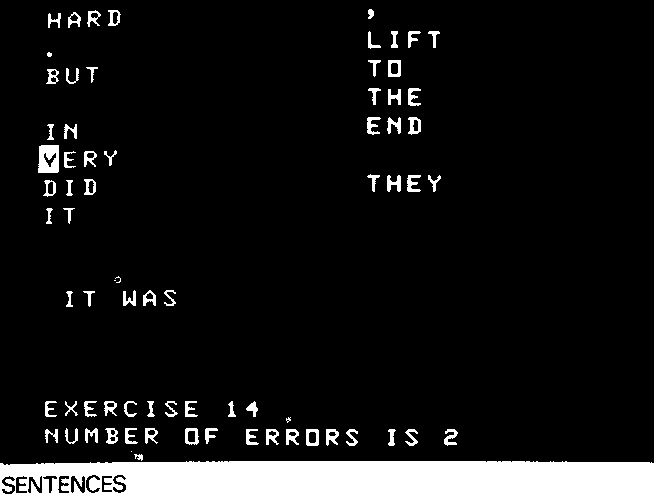 Each exercise shows a sentence with the words and punctuation marks randomly rearranged. The pupil must reconstruct the original sentence by selecting the items in the correct order.